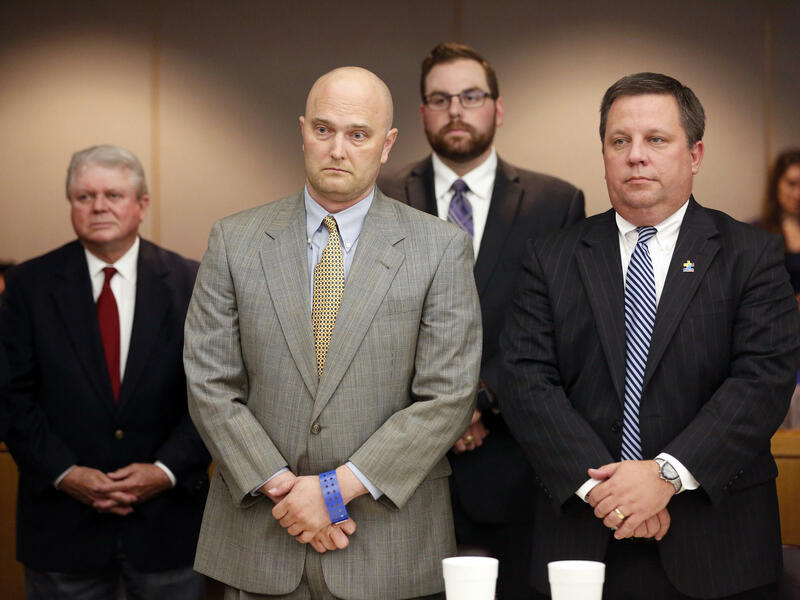 Former Balch Springs Police Officer Roy Oliver (foreground left) stands next to defense attorney Miles Brissette (right) after being sentenced Wednesday to 15 years in prison for the murder of 15-year-old Jordan Edwards. Oliver, who was dismissed by the department, has said he believed the vehicle was moving toward his partner, endangering him. According to The Associated Press, "Police initially said the vehicle backed up toward officers 'in an aggressive manner,' but later admitted that bodycam video showed the vehicle was moving forward as officers approached. Oliver's partner told jurors he didn't believe his life was ever in danger." Oliver was convicted of murder on Tuesday after Dallas County jurors deliberated for more than 12 hours over two days. The Dallas Morning News says the same jury took five hours on Wednesday to decide on the sentence, which also includes a $10,000 fine. Oliver would be eligible for parole in 7 1/2 years, his lawyers told the AP. "He can actually see life again after 15 years and that's not enough because Jordan can't see life again," Edwards' stepmother, Charmaine Edwards, reportedly said of Oliver after he was sentenced Wednesday. However, she conceded that the verdict and sentence was "a start for us." Attorneys for Oliver said they would appeal the sentence. District Attorney Faith Johnson described Oliver as a "killer in blue." Later, she said she believed the conviction of Oliver was "historic." The AP notes, "The murder conviction was extremely rare for a shooting involving an on-duty officer." As member station KERA reported previously, "The last time a Texas police officer was convicted of murder for killing in the line of duty was 1973. That's when 12-year-old Santos Rodriguez was shot in the head while handcuffed in the back of a squad car. The Dallas officer who shot him was sentenced to five years in prison, and served half of the sentence." Miles Brissette, an attorney for Oliver, said the verdict sets a dangerous precedent for police officers. "It sends a chilling message to some as to how an officer's going to react in a similar situation," he said, according to KERA. "Are they going to go to work one day and be facing a murder charge the next for making a decision that was a split second? That's what was at issue here." According to the AP, "Edwards' father has also filed a civil lawsuit in connection to the shooting. The jury's decision is not just about Jordan Edwards, but all other black men and women who have been killed and not received justice, said Washington, the attorney for the teen's father."